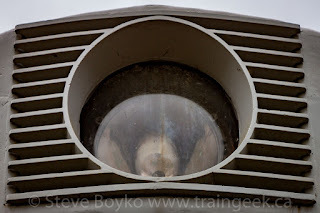 Confessions of a Train Geek: Passing a Half Century (Part 4) - To Craigellachie and Beyond! Passing a Half Century (Part 4) - To Craigellachie and Beyond! For my 50th birthday, my wife and I drove through Alberta and British Columbia. You can start at the beginning here.... or read the whole series as an eBook! 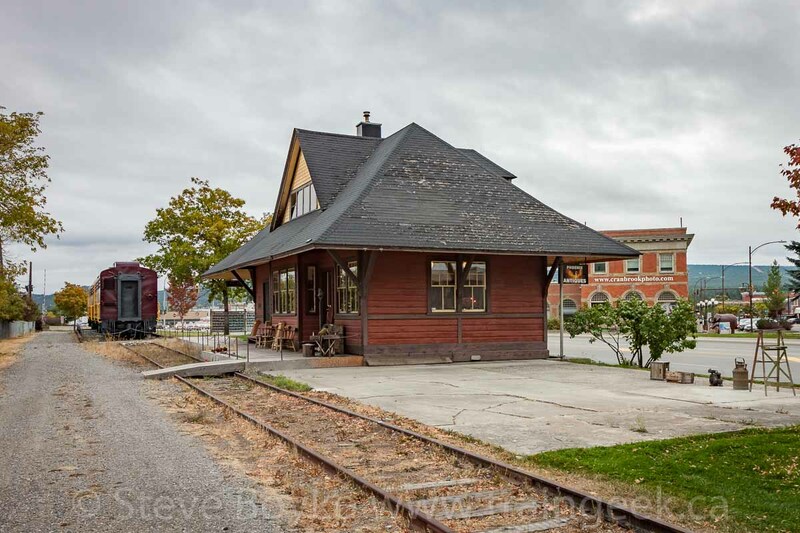 - Stephen Fearing, "The Station"
We started the third day of my 50th birthday trip in Cranbrook, British Columbia. My original plan was to travel from Cranbrook to Craigellachie via Golden, and spend the night at the impressive hotel in Three Valley Gap. However, in our research, my wife and I discovered that the hotel didn't have wifi and had a few other things we didn't like, so I ended up booking a hotel in Sicamous, BC. Anyway, let's go. Another long post. Before we left Cranbrook, I wanted to photograph the former Elko, BC station as well as the A-B set of CP 4090 and CP 4469. These are all on display just outside the Canadian Museum of Rail Travel in Cranbrook, on the original location of the museum. 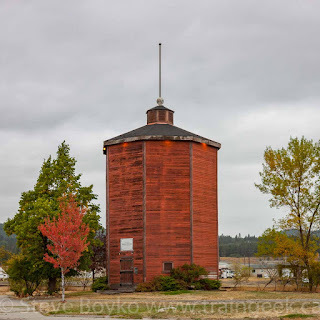 I didn't have time to do that the previous evening as we rushed to Creston to photograph the grain elevators before darkness fell. The train station was built in Elko in 1901. It was moved to Cranbrook in 1987 and heavily rebuilt inside. It's now home to Phoenix Antiques. Next to the train station is the former Cranbrook CPR water tower. This beautiful old tower looks pretty good! 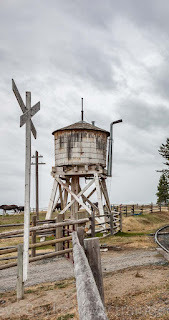 Naturally the BIGDoer team has written about this water tower. 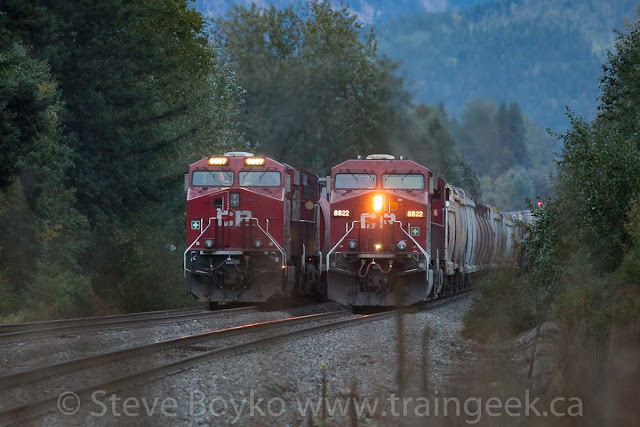 Let's turn now to the stars of the display, CP 4090 and CP 4469. 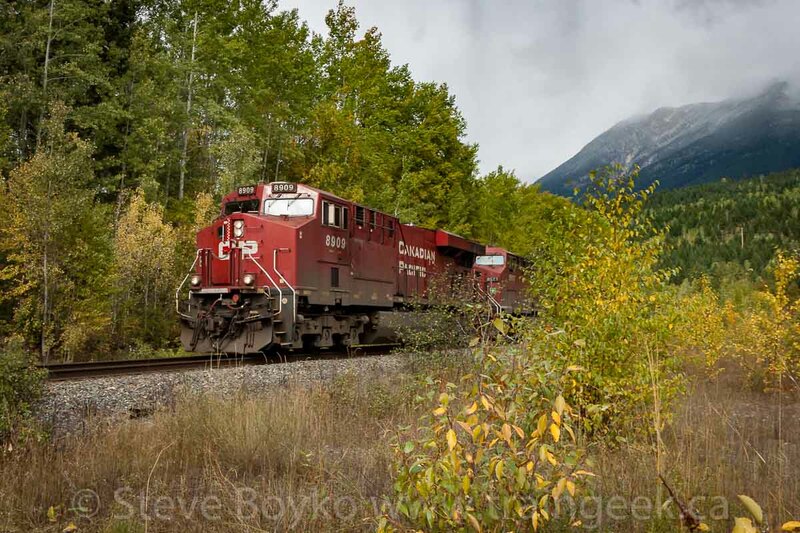 CP 4090 is an MLW FA-2 locomotive, and CP 4469 an MLW FB-2 locomotive, both built in 1953. 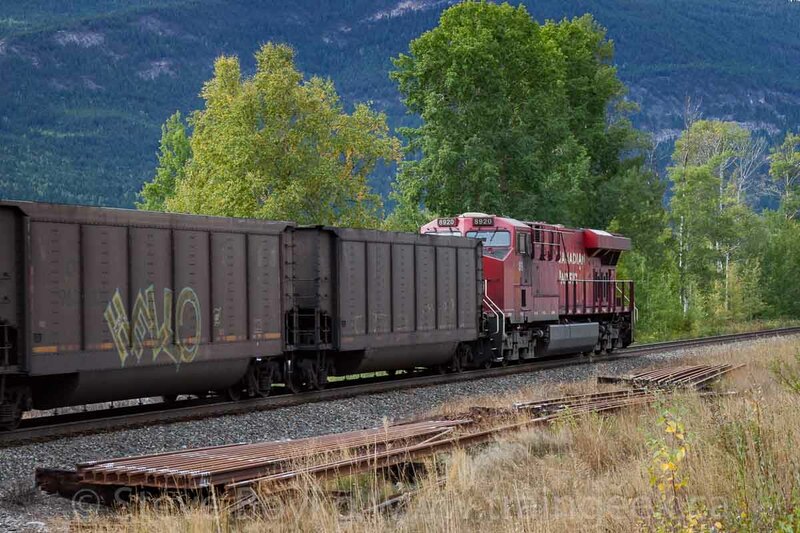 These first generation diesel-electric locomotives had 1600 horsepower each under the hood. 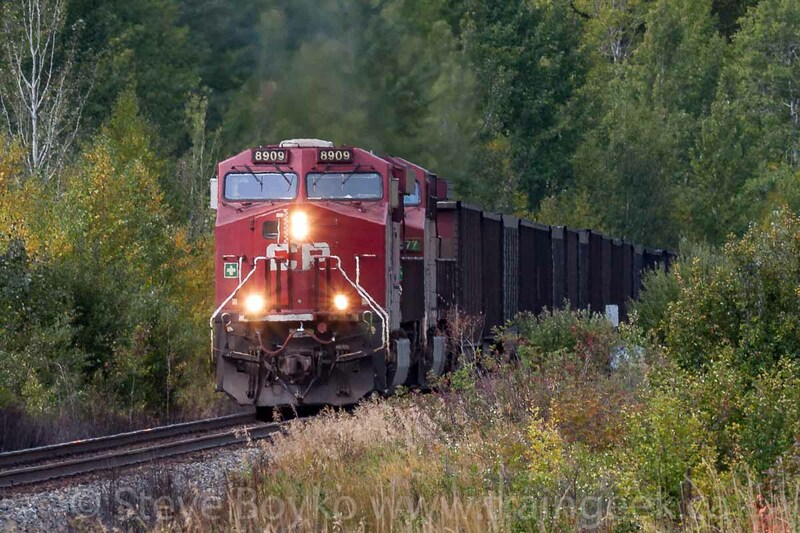 The two are similar mechanically except that 4090 has a cab for the crew and 4469 does not. That's why 4090 is called an "A" unit and 4469 is called a "B" unit. These locomotives were built as freight engines and do not have steam generators, although they do have steam lines to "pass through" steam. They both served in the western region for a few years but proved unsuitable for the mountains, and were redeployed to Ontario. 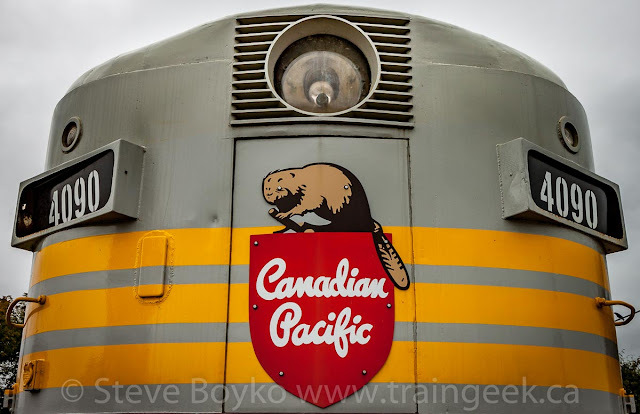 At one point both locomotives were repainted into CP Action Red with a small multimark at the rear of the car body. They served until 1977, and were retained by CP for historical purposes. The museum acquired them and moved them to Cranbrook in 1992. 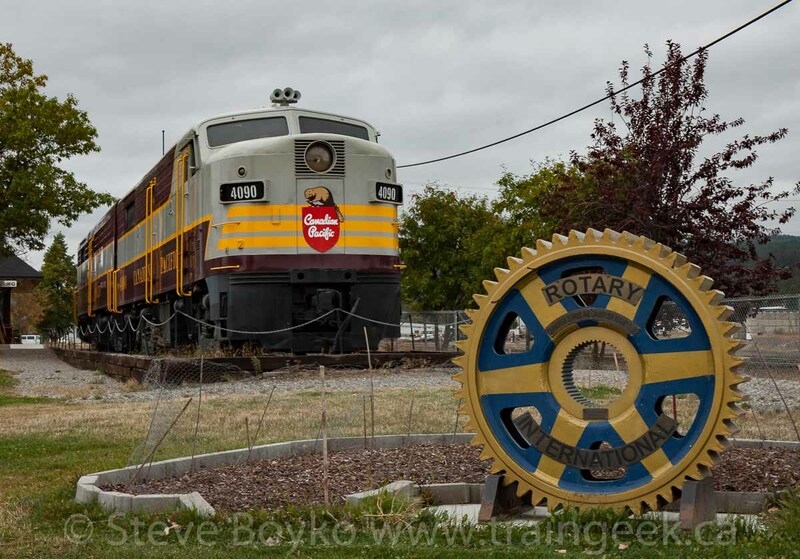 They sat by the former Elko station in primer paint for a number of years until they were restored as a project of the local Rotary Club in 2015. 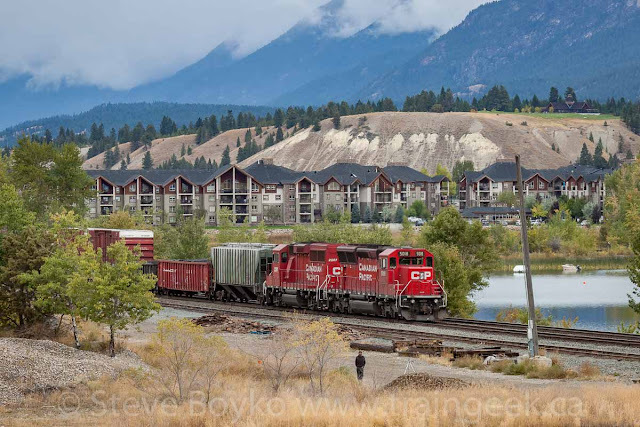 There was a train in Cranbrook when we were there, headed by CP 8719 and CEFX 1041, with CSX 3043 on the tail end. I think that building is owned by CP but I don't know its function. We headed out of Cranbrook on highway 95 en route to Craigellachie. Fort Steele is not far out of Cranbrook and is where the north-south Windermere subdivision meets the east-west Cranbrook subdivision. 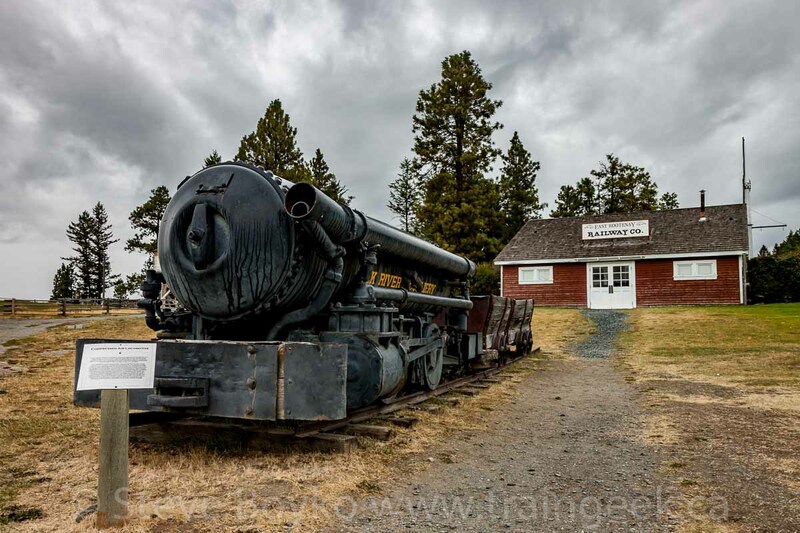 It's also the home of the Fort Steele Heritage Town, a historic park / museum providing a glimpse of life in the past. One of the attractions is a steam train, led by locomotive 1077 and featuring some classic railway cars. 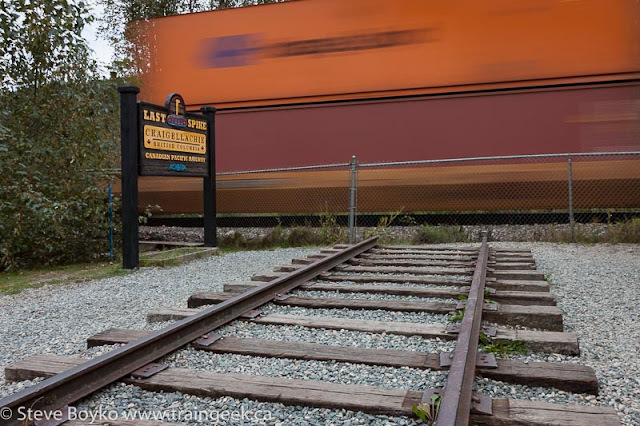 I knew the train had ceased running for the season, but I was hoping that I could wander over and take a few photos. We waited a few minutes until the park opened at 10. I went into the ticket office and asked if I could take some photos, and the woman there said it was OK. However, there was a locked fence around the train loop and I didn't want to go over it. It was pretty clear that they didn't want people wandering around, so I took a few photos from the good side of the fence with my long lens and left it at that. The star of the show is #1077, an MLW 2-6-2 steam locomotive built in 1923. This locomotive worked in logging service on Vancouver Island until its retirement in the early 1960s. It was moved to Fort Steele in 1989 and has been working here since 1992. On display by the station is a compressed air locomotive, quite a unique piece of kit. 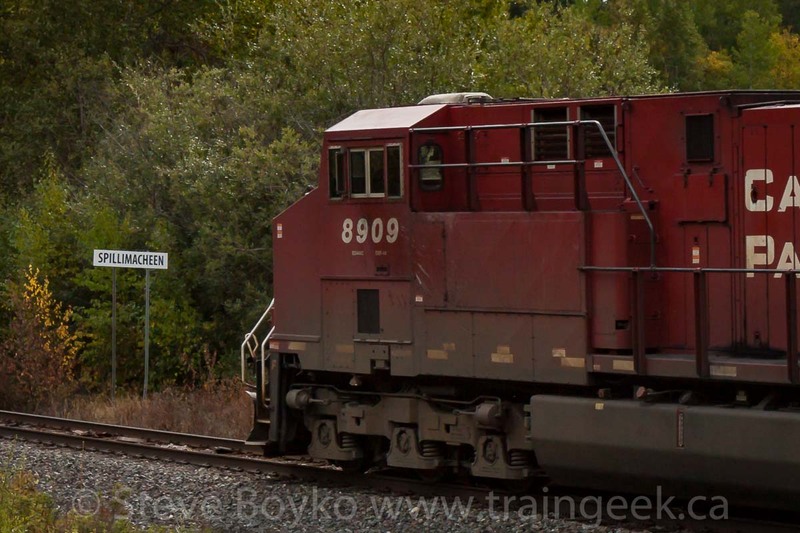 As I was taking photos, I heard a train roll by on the nearby CP Windermere subdivision. We ended up passing a CP wayfreight as we drove north along highway 95. I didn't stop but I saw it had a couple of ECO units and a lot of lumber loads. I wasn't really expecting a lot of railway action on this line. My intent was to get to Craigellachie and that was about it. We stopped in the lovely town of Invermere for a little shopping and a little railfanning. Well, we stopped for the shopping and happened to notice a train stopped in town. 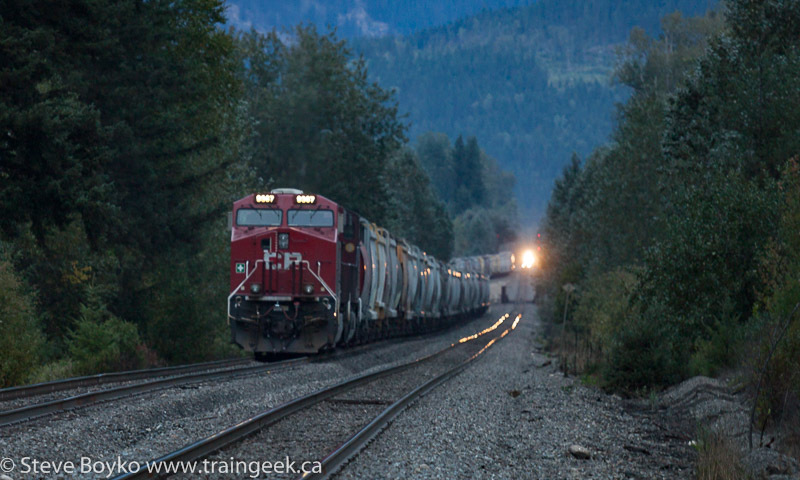 CP 5018 and 2287 were idling away down by the river. 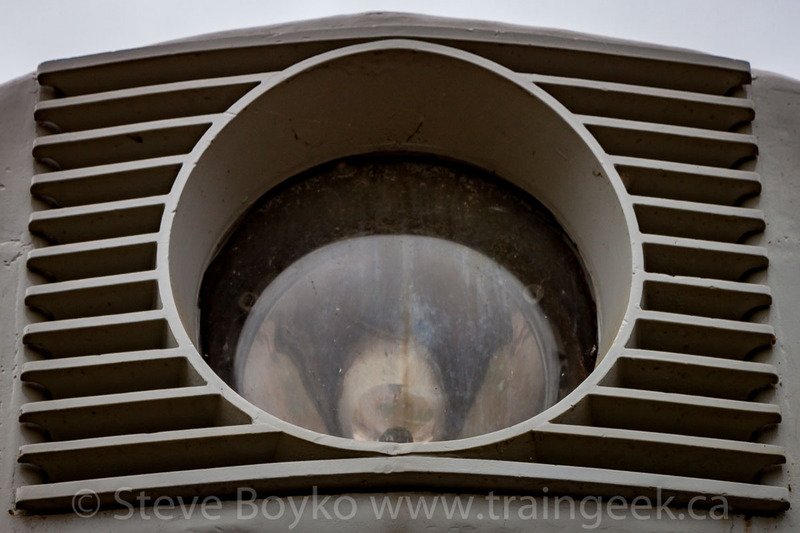 You can see in the photo above that a railfan was waiting patiently down there with his camera on a tripod. In fact, here's his video of the same train! You might have to do a little fast-forwarding..
After I took a few photos, we went and visited the shops. It's a lovely town to visit. Stop in at the Invermere Bakery for a nibble! Well over an hour later, we were continuing north along highway 95 just north of Spillimacheen when we saw a southbound coal train, led by CP 8909. I performed a quick U turn and caught up to them as they passed the sign 1 mile out from Spillimacheen. Spilli.. Spilli... spill a machine? And.. what the heck, I chased one more time and caught them coming through "town" with a telephoto shot, for variety. I waited here while they rolled on by, photographing all four locomotives... CP 8909 and 8577 on the head end, CP 8764 in the middle, and CP 8920 on the rear. A track foreman in a CP high-rail truck was patiently waiting for me to get the heck out of the way. Thanks for being patient! That train was unexpected. I was pleased to catch a "real" train on the road. 17 minutes later, I was on the side of the road, photographing another coal train. I'm not entirely sure where we were, but let's say it was around Castledale. The train was stopped. I took a number of photos from the road, but I didn't linger long because it was raining and I feared my wife might be losing patience with my railfanning. I did try a little rain reflection photography, if that's a thing. CP 8901 was on the head end, with CP 8928 in the middle and CP 8935 on the tail end. Soon we arrived at Golden. There is a large yard in Golden and that's the first thing you see as you approach the town. I immediately noticed two multimark SD40-2 units working in the yard and took this (blurry) photo of them. 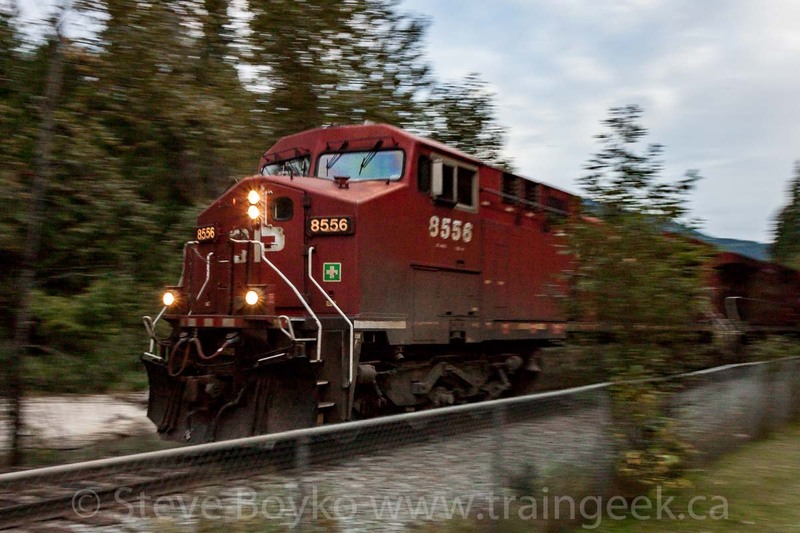 CP 5973 and 5875 were working with CP 9604 in the yard. We stopped in Golden for a little walk and a quick snack - at a 7/11 I think - then we kept heading west toward Craigellachie. We were coming back to Golden the next day so there was no need to linger. 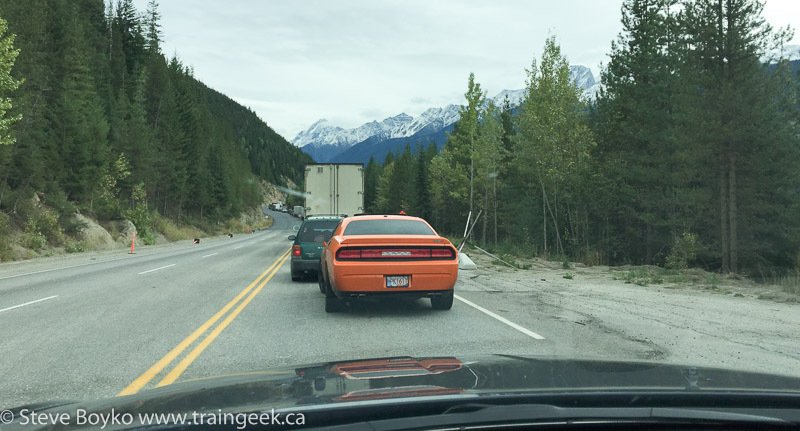 British Columbia is twinning a lot of the Trans-Canada Highway between Kamloops and the Alberta border. We got caught in some of that construction work and were literally parked on the TCH for about 45 minutes. I think they were blasting rock off the mountain, so that takes time to ensure it's safe after the blasting. We ran into the same thing the next day, but we could actually see the blasting that day. We passed by Three Valley Gap but didn't stop, except to take a quick photo across the water. Onward to Craigellachie! What can you say about Craigellachie? It has enormous historical significance as the location of the Last Spike ceremony for Canada's first transcontinental railway. 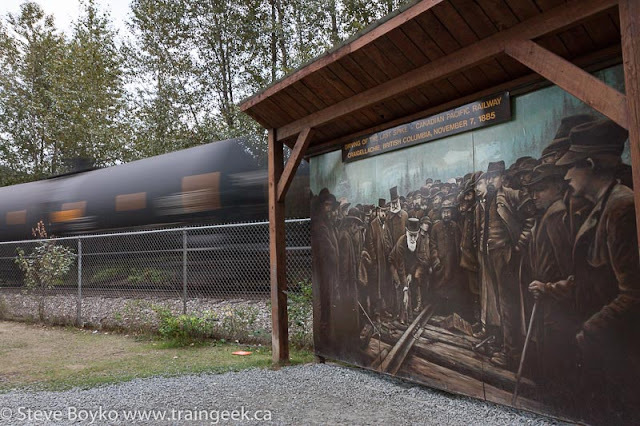 On November 7, 1885, CPR financier Donald Smith drove an iron spike into a tie to signify the completion of the railway. The spike was badly bent, so roadmaster Frank Brothers pulled it out and Mr. Smith drove another "last spike" in successfully. This one was also extracted to prevent its theft, and yet another ordinary iron spike was driven in and left there. Apparently since it was (almost) my birthday, CP gave me a gift of a train... CP 8556 East came blasting by in the near dark, with CP 8531 trailing and CP 9707 as a mid-train DPU. They have a piece of track on display... presumably for photos and to keep people from stepping onto the real track and getting killed. Maybe they have spike driving photos here when the store is open? The famous group photo is on display here as well. Of all the angles I shot while the train went by, I like the next one the most. Note the caboose on display in the background. 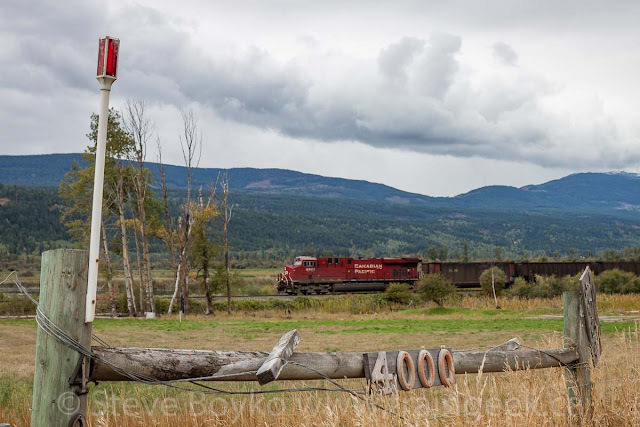 This is labelled as CP 437336, and my Trackside Guide says it was a tourist information booth. It seems very out of place and not part of the display at all. So that was Craigellachie. Another one off the "bucket list". 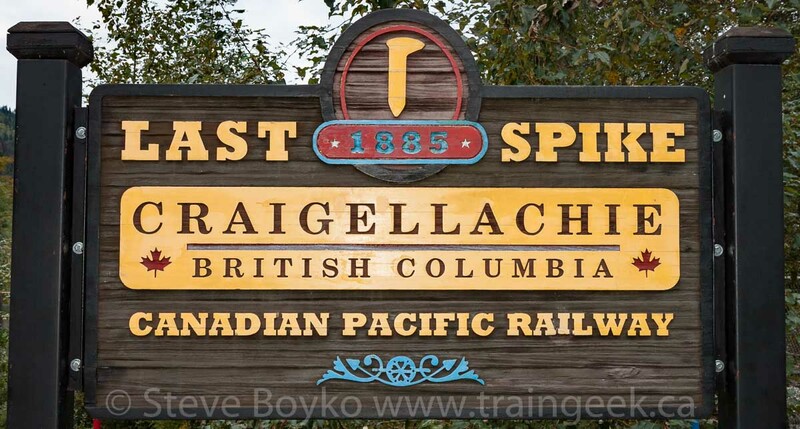 Check out Rick Mercer's piece on Craigellachie, including a train ride! We drove along in the near dark toward Sicamous.. but unfortunately for my wife, I saw a train in a siding and had to stop. 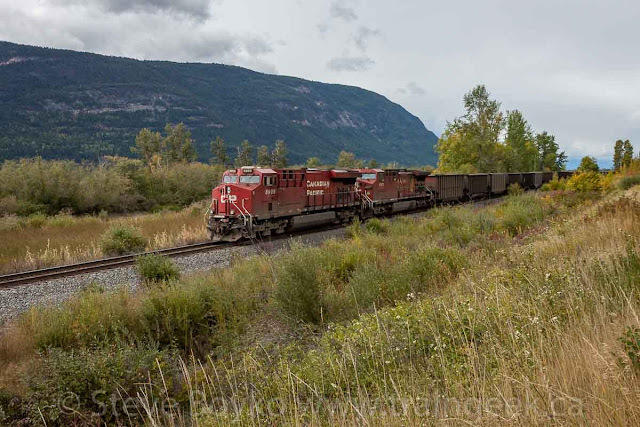 I had no real idea where this was, but a little investigation shows the train was in the Malakwa siding (mile 31.9 of the CP Shuswap subdivision). 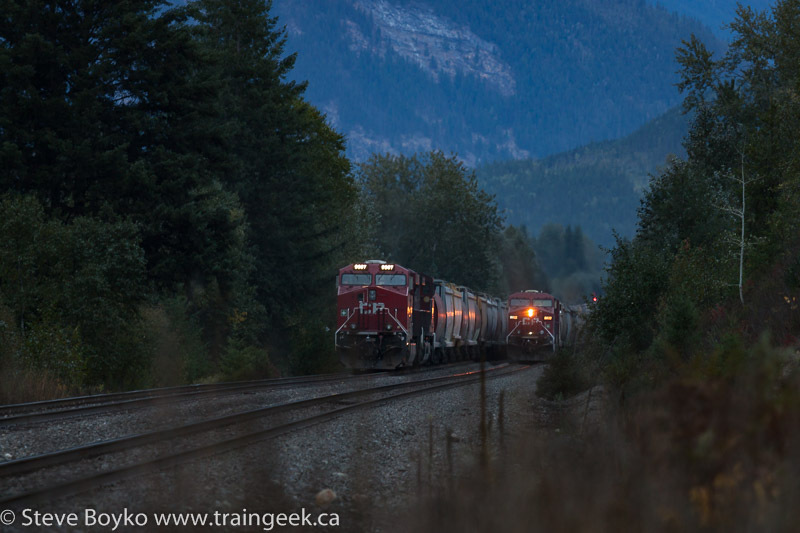 You'll notice the train overtaking CP 9367. I hardly ever shoot with a tripod, but here I made an exception, as this was 7:50 PM and the sun was long gone. I was shooting with my long lens (70-200mm) at 1/15s with the lens wide open (f/4.0), although I was still using ISO 100 to keep the noise down. I left this one uncropped and mostly unprocessed so you get an idea of how far away I was, and how much light was available. 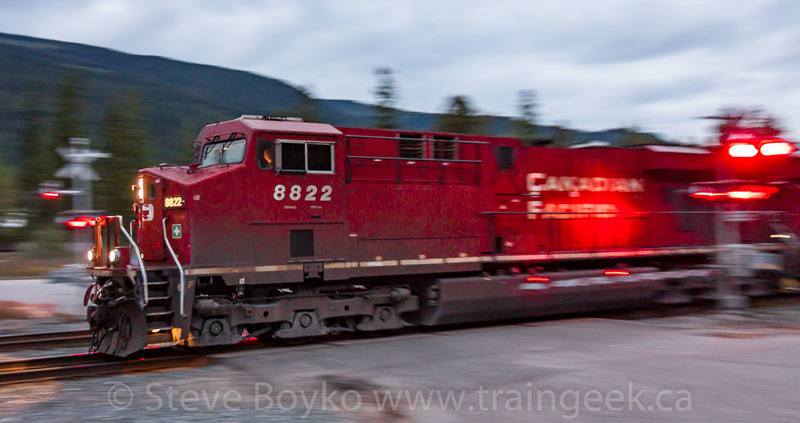 CP 8822 pulled up beside CP 9367 and stopped. 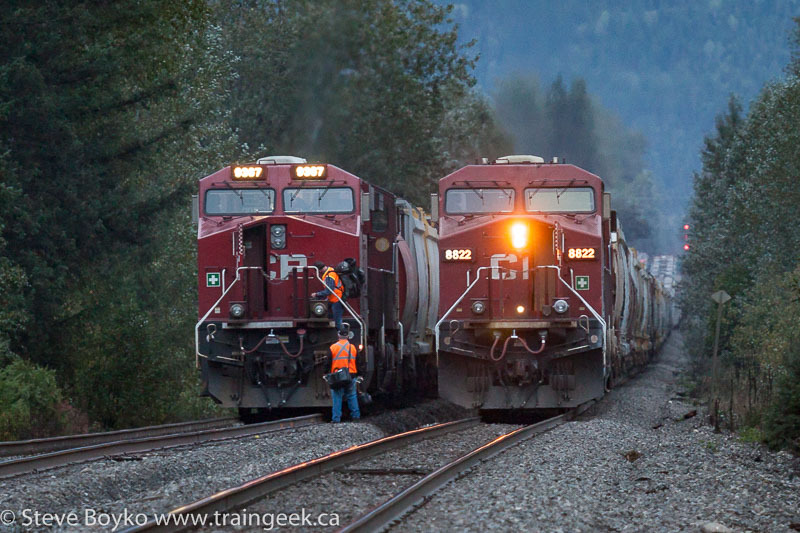 The doors opened and some crew went back and forth between locomotives. I don't know what was going on here but my guess is that CP 9367's crew ran out of time and 8822 brought a new crew to replace them. Just a guess. Time for a crew change? Once they were finished with that, CP 8822 carried on westward. CP 8948 was the trailing unit. But wait.. what's that behind 8948? SMW 850776 is a former Saskatchewan Wheat Pool car. Nice to see another one of those still around! We finally made Sicamous after a long day of travelling. I'm pretty sure my wife was sic-a-railfanning by this point but she was a trooper and didn't complain. Love that woman. We checked into the Sicamous Best Western (yay for a free stay using points!) and went for supper at Grandma's and Grandpa's. The food was great but our waitress was a little too perky. Maybe we were just tired after a long day of travel. 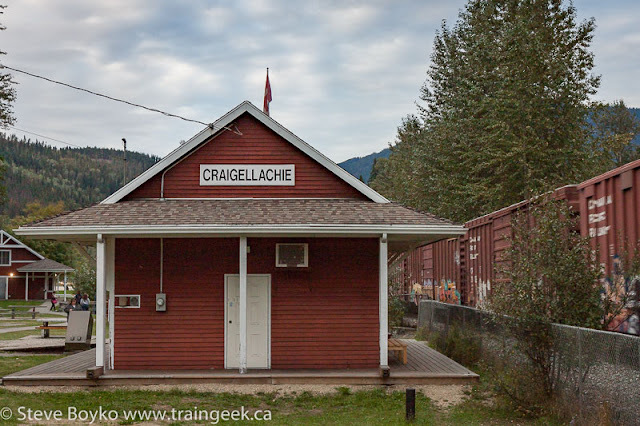 The plan for day 4 was to travel from Sicamous to Golden, stopping at Three Valley Gap and the Revelstoke Railway Museum en route. On a map, it's not a long distance, but I wanted to have lots of time to spend at the museum and of course see a train or two if possible. 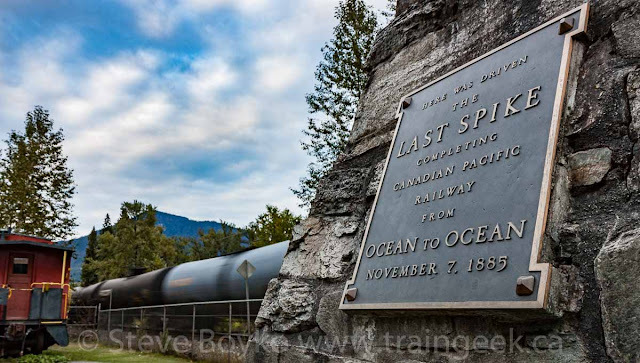 When I was at the Last Spike monument many many years ago, they had a few sledgehammers available for people to have their photos taken on that piece of track. Thanks, David, I'm glad you confirmed what that track was for!